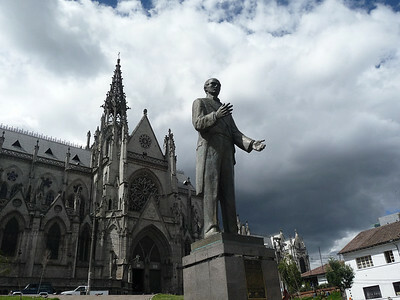 Finding plenty of beauty in Ecuador. 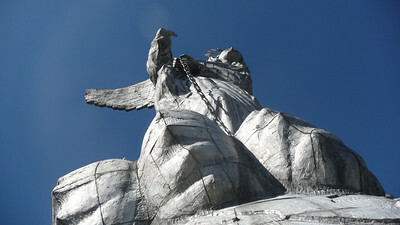 The Virgin of El Panecillo, a massive monument atop a southern hillside, is visible by all of Quito. 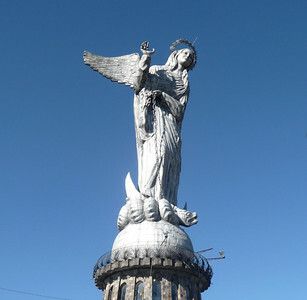 Erected in 1976, the "Virgin of Quito" is crushing a serpent beneath her feet, on top of a globe, symbolizing her triumph over evil. 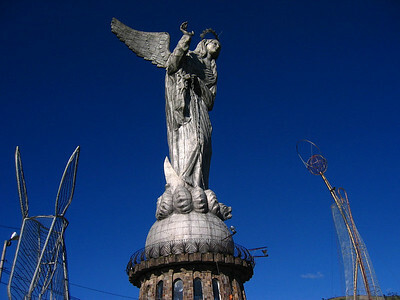 She is regarded as the city’s guardian and protector, on the hill known as the Panecillo, or Little Loaf of Bread, in Spanish. 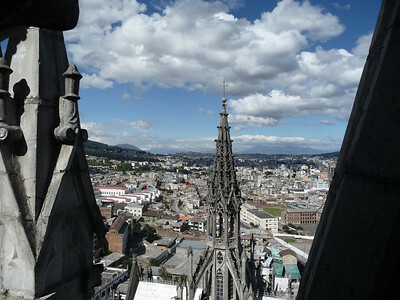 A balcony about a 100 feet above ground around the entire circumference of the monument provides fantastic views. 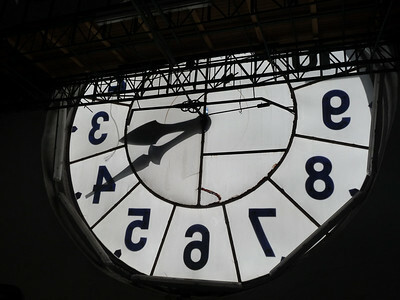 Inside, the walls are covered with large photographs that document her construction. We stayed at a hostel called "Secret Garden" in the old town. 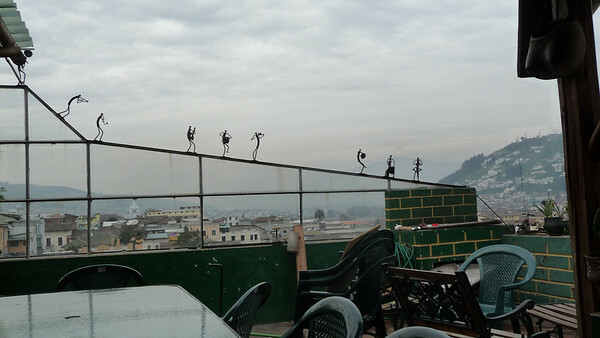 Great mix of people there, great views, including this patio with musical figurines on the railing. Home cooked all-you-can eat breakfast was fresh and delicious every day. A melting pot for travelers. 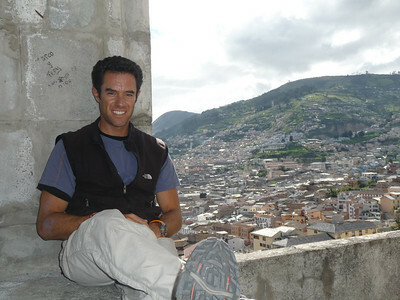 Right underneath violinist's elbow, checkout the Virgin of El Panecillo on the hill top in the background. 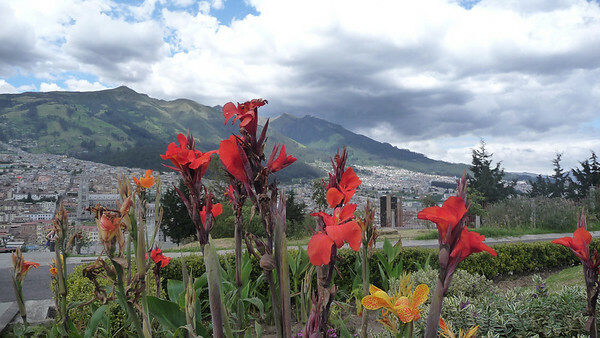 Flowery view of Rucu Pichincha (mountain), from Ichimbia park. The stadium erupts as Deportivo scores. Incredible Fútbol match on our 2nd day in Quito. 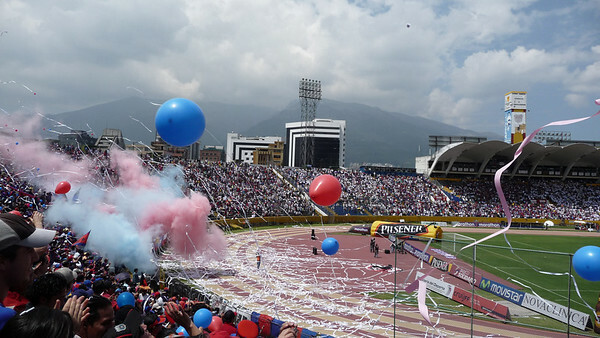 Intense rivals in the biggest game of 40 years for Quito. Deportivo stood to win the national championship if they won the game, and "Liga" were the current champions of all of the Americas. Learned great chants (for Deportivo): "Y dalle, y dalle, y dalle Quito dalle." 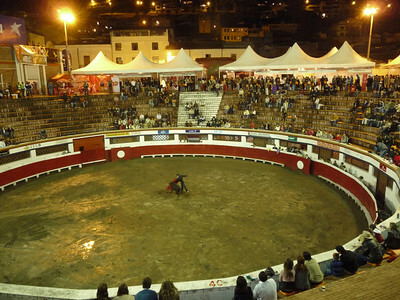 A bull fight right down the street from our hostel in Quito. Fortunately the bulls were spared. This tiny venue was full of wine and cheese booths for sampling, and scantily-clad marketing professionals (with enhanced body parts) giving out free swag. We befriended the entire section of the stadium where we sat, a whole family and extended relatives. 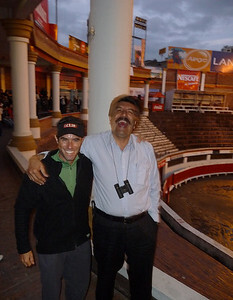 Lora held her own dancing on the stadium benches, and the father and I had many laughs. He was rather jovial, always smiling and bursting into laughter, the ringleader of mischief. After our Fútbol match in the morning, we went to the Museo del Banco Central in the afternoon, and upon leaving, saw a huge crowd lined up to get back in. It was for a hip hop concert at the auditorium in the same building. Hell yes we went. 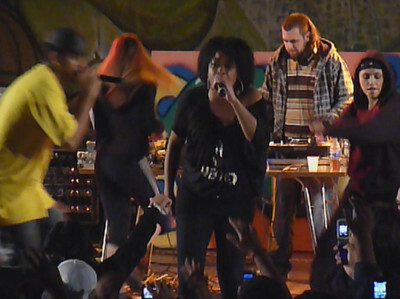 $5 got us nearly 4 hours of totally awesome hip hop. 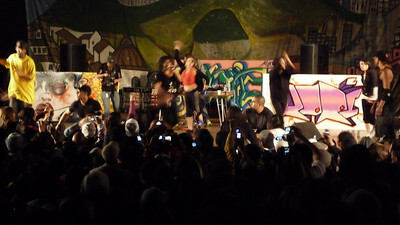 The theme of the performance was "Women in the Arts" - female rappers at the mic and female artists graffiti was displayed on stage. The main act was a woman named "Ari". It was off the hook, off the handle, and definitely off the kitchen cabinet. 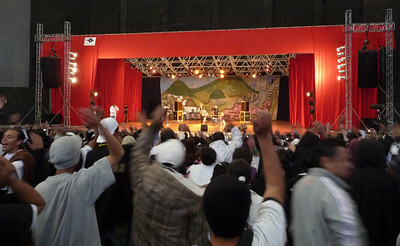 On the flight to Quito I had told Lora I really wanted to seek out some Ecuadorian Hip Hop. It fell into our lap. 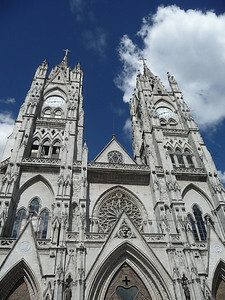 Cathedral facade, The Basilica del Voto Nacional. 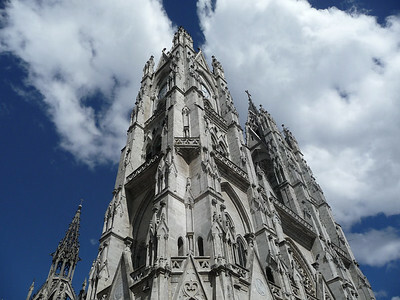 You are able to climb up the bell tower on the right, all the way to the top, and then up a winding metal staircase into the spire itself. Amazing views inside and out. 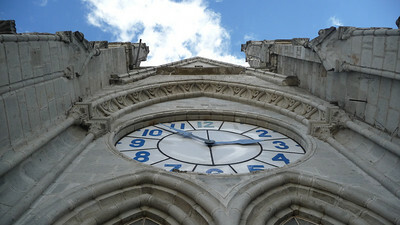 The bell tower we climbed, our first internal "summit". 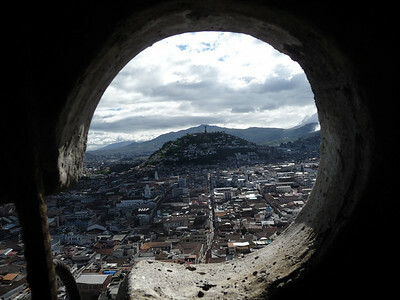 As you climb up the bell tower and into the spire, you have insane views of the other bell tower, as well as all of Quito. 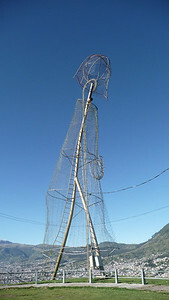 Here is the rebar supporting the spire, that comes to a peak just over my head. 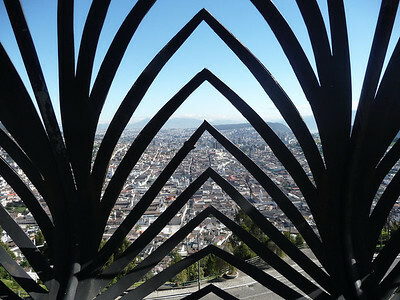 Looking out from the Basilica you get a variety of shapes to frame your view of Quito. 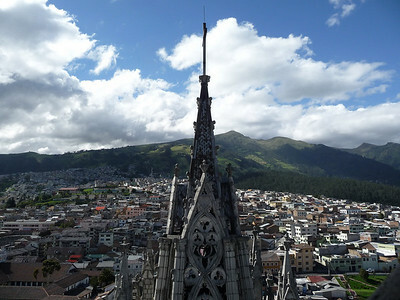 The Virgin of Quito on the hilltop! 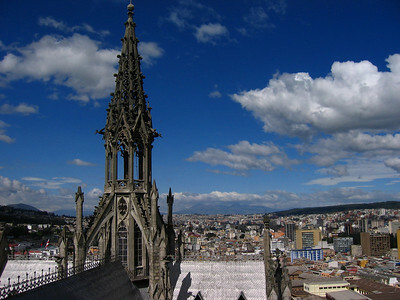 If anyone calls, I'm at the top of the The Basilica del Voto Nacional, inside the spire on the right. 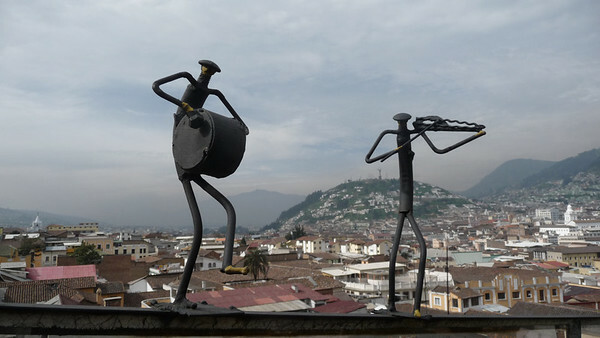 We had amazing weather - warm, mostly sunny, Quito was splendid. 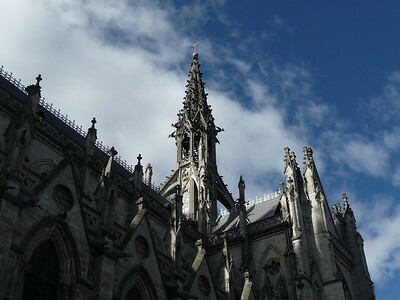 Gargoyles and Geckos jutted out from the building. 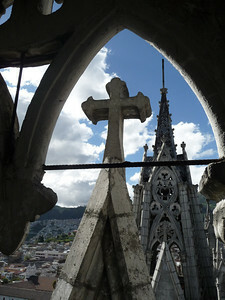 Looking out from the balcony of the Virgin monument. No, I'm not trying to look up her skirt, it's just a cool perspective. 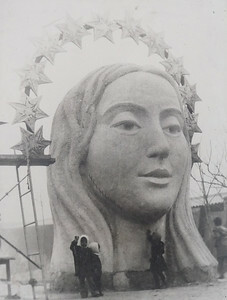 The Virgin's head under construction and it's massive size. 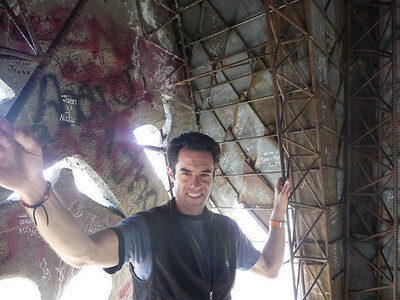 Photo from inside the monument. 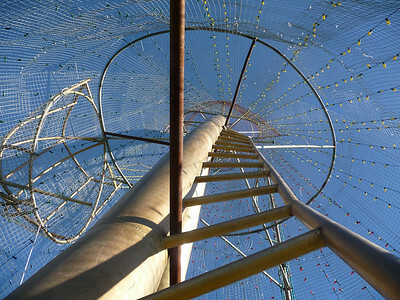 Next to the monument were several wire frame statues, all covered with Christmas lights that are visible from all over the city at night. You can climb right up there too. Amazing how much risk you are allowed to take.